elcome to our beautiful area. Hickory epitomizes the phrase "Southern hospitality." We are rich in history and proud in heritage, yet modern in industry and economic development. The folks are friendly, and they will make you feel right at home, whether you are here for a visit or a stay. From our famous furniture industry to arts and history, from golf courses to lakes, we have it all. Come see for yourself, and see why we like calling Hickory, North Carolina home. Following is a primer of information about Hickory and Catawba County. After that, you will find links that have been provided to present to you the most up to date and detailed information available for your special area of interest. We hope that our Classic Properties web site will be your base of information on Hickory and Catawba County, and that when you are ready to relocate here, you will call on us. Catawba County is located in the western part of North Carolina, in the foothills of the Blue Ridge Mountains. 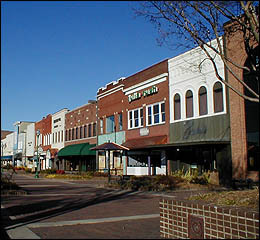 It's largest city, Hickory, is the economic and geographic center of North Carolina's fourth largest Metropolitan Statistical Area. Hickory is approximately 70 miles east of Asheville, 50 miles northwest of Charlotte, and 90 miles west of Greensboro. It is intersected by Interstate 40, US Hwy. 70 and US Hwy 321. While the city of Hickory is primarily in Catawba County, the city limits extend into portions of Burke and Caldwell Counties as well. 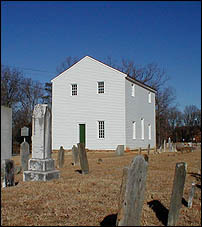 The area has a rich historical past, much of which is still evident as you drive around. Many of our buildings have been proudly preserved and offer great glimpses at our past. 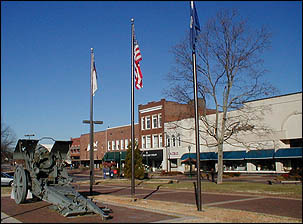 The county of Catawba was established December 12, 1842. Most of the early settlers were of German and Scotch-Irish descent. Hickory Tavern was chartered in 1863, and the city of Hickory was incorporated in 1870. Artifacts have been found in the area including pottery, pipes, arrowheads, tools and carvings dating to prehistoric times. The Catawba County Historical Museum offers wonderful exhibits and information about our delightful and colorful history. The arts are alive and well in Hickory and Catawba County. The Hickory Museum of Art is the second oldest museum in North Carolina, and is known for its concentration of 19th and 20th century American art. The Catawba Science Center, part of the Science Arts Literature Together (SALT Block) in Hickory was founded in 1975 and offers hands-on learning, permanent exhibits, and traveling exhibits throughout the year. The Hickory Community Theater is located in the old City Hall and Fire Department, and offers wonderful performances each season featuring local actors. A visit to the building alone is an educational experience. Among our well-known local artists are woodwright Eddie Hamrick and potter, the late Burlon Craig. Both have been nationally recognized and have works on display in the Smithsonian. Many fine examples of local artisans work may be found in local galleries and shops. 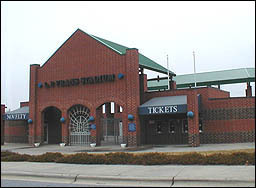 The Hickory Crawdads are a "Class A" affiliate of the Texas Rangers, and they entertain fans seasonally in the L. P. Frans Stadium in Winkler Park. This minor league baseball team led the South Atlantic League in attendance during its first year in 1993. The Hickory Motor Speedway has been in continuous operation for over 50 years. It is an icon in motorcar racing, launching the early racing careers of some of the greats, including Junior Johnson, Ned Jarrett, Bobby Isaac, Ralph Earnhardt, the late Dale Earnhardt, Harry Gant, and Dale Jarrett. Approximately $2.5 million each year is added to the local economy by the Hickory Motor Speedway. Catawba County's three lakes are home to many bass fishing tournaments between March and October. Our lakes are famous for Large Mouth Bass, White Bass and Striped Bass. These lakes also offer wonderful outdoor recreation for family activities such as boating, water skiing and swimming. Lake Hickory covers 4100 acres with 104.9 miles* of shoreline. Lake Lookout covers 1270 acres with 39.1 miles of shoreline, and Lake Norman covers 32,510 acres with 520 miles of shoreline. 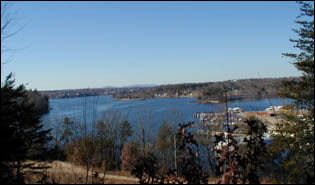 Lake Norman is the largest manmade lake in North Carolina. Nearby Burke County offers scenic Lake James with wooded shorelines and panoramic mountain backdrops. The Catawba County area also offers many opportunities to participate in hiking, canoeing, picnicking, jogging, and cycling at any one of the following sites: Glenn C. Hilton, Jr. Memorial Park, Jaycee Park, Riverbend Park, and Baker's Mountain Park just to mention a few of the many area parks. There are 43 public schools in the county with approximately 24,000 students. There are 2 colleges: Lenoir Rhyne College, a 4 year liberal arts institution and Catawba Valley Community College. 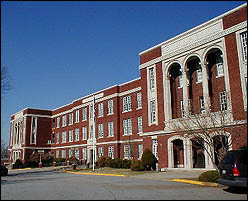 Nearby Caldwell County offers Caldwell Community College and Technical Institute. These community colleges provide an excellent array of educational offerings to the adult population. Also available are various private schools for all grade levels. Its location in the foothills of the Blue Ridge Mountains exerts a strong influence on the county climate and ambiance. The county is sheltered by mountains that moderate the winter temperatures and provide refreshing summer breezes. Elevation ranges from 705 to 1780 feet with an average of 995 feet. The average year round temperature is 68.8 with an average annual rainfall of 49 inches. Hickory/Catawba County is the center of a heavily industrialized area, and is known worldwide as a furniture manufacturing center. Its traditional industries of furniture, hosiery and textiles have been joined by higher tech industries such as fiber optics and telecommunications cable. A multi-million dollar agricultural industry adds to the diversity of our area's businesses. Catawba County's population as of 2011, including the inhabitants of its 8 municipalities was estimated at 154,992+. The Hickory Metropolitan statistical area is the fourth largest in the state, with a population of approximately 366,359. The Hickory MSA is corporate headquarters of 40 firms with at least 500 employees and $500 million in sales.